On the main Data View tab, all of your synchronized data from QC-CALC is viewable via the main data grid. Measurements are color-coded for out of tolerance measurements, deleted points or parts, and parts containing notes. Move your mouse over a measurement with a note and it will pop up. Filtering from the main screen allows you to quickly create new filters and test them on your data. See the Advanced Filtering area for a more detailed explanation. Quickly customize the look of the data grid by searching and turning on/off various features and factors. 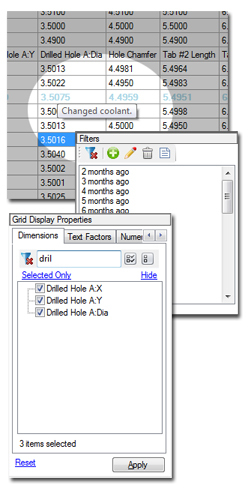 The data grid can easily be copied and pasted into MS Excel.